Sig Hansen is one of the captains the documentary television series Deadliest Catch. With that claim to fame, he rightly received a card in 2010 Topps Allen and Ginter. Supposedly, Hansen also has a relic card and an autograph card card in the set. The relic redemption card has popped up on eBay here and there, but for over a month, no one has seen an autograph card. There has not been one eBay auction with a Sig Hansen auto or redemption auto, which led many to believe he wasn't part of the set despite being on the checklist. Does this mean that his autos will be retail exclusive cards? Or, perhaps they will be found in this new fancy value packs that you can get at Wal-Mart. The A&G packs in the Wal-Mart boxes are all hobby and people have pulled rip cards, relics and silk cards out of these. 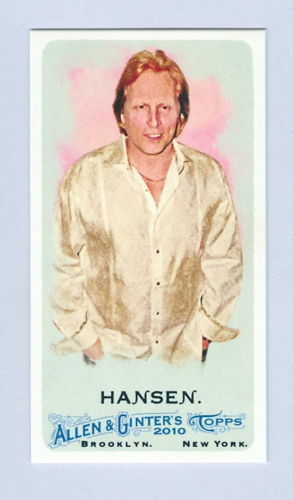 If anyone finds a Sig Hansen auto card, I bet that card would go a decent price on the secondary market. He seems to have a popular following, additionally A&G is popular with set collectors. Update: We've got word that the relic-card redemptions will be autos instead. So, if you have one of those cards, you're getting an upgrade.